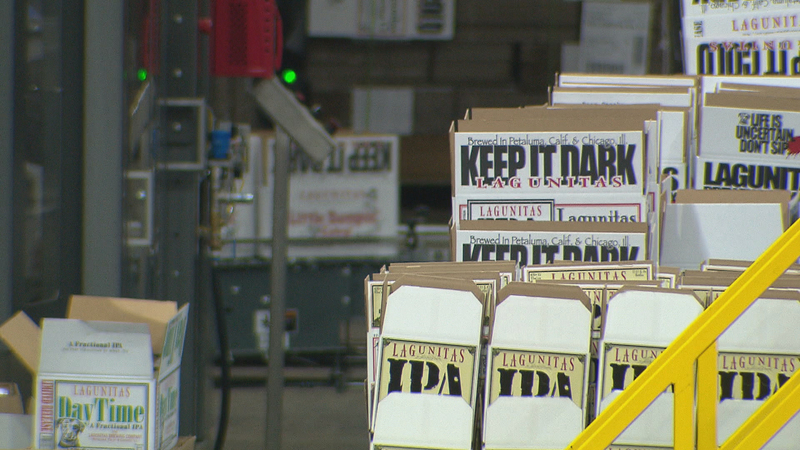 Lagunitas Brewing Company became a major presence in the Chicago craft beer scene when it opened its second brewery on the city’s West Side in 2014. The company grabbed headlines again the following year when it sold a 50-percent stake in its business to the massive Dutch brewer Heineken. And last week, Lagunitas made another splash when founder Tony Magee announced in a blog post the brewer had sold the remaining 50-percent stake to Heineken in order to help the company “go farther more quickly than we could have on our own,” Magee wrote. Magee joins host Phil Ponce to talk about the future of Lagunitas as a global craft beer presence. Below, a Q&A with Magee. Why sell the rest of the company to Heineken now? Well, in the first place, we called Heineken. Heineken wasn’t shopping. And Heineken was not planning to invest in any craft breweries. They knew that they wouldn’t know what to do with it – it’s not what they do for a living, it’s not how their internal incentives are built, around the values that make craft brands successful until, quite frankly, we called and they saw us as a unicorn. I knew that they didn’t want to take over Lagunitas because they didn’t want us to leave, they wanted us to enjoy the company and go on doing the thing we do they knew they didn’t know how to do. Internally, we have an awful lot to offer Heineken. I have joked with them that my job is to take over Heineken, but I mean that in an apocryphal sense. We could infect them and have a big influence on how they approach this new world of beer that is as undeniable as a tsunami. Most people don’t know this but in San Francisco, craft is 70 percent of the dollars in high-end beer. So that means Budweiser, Miller, they fish through this banquet of crumbs for the last 30 percent. In the U.S. we don’t work with their Heineken operating company at all, we operate shoulder to shoulder with them and that’s where we are within their corporate structure. But abroad, we work directly with their operating companies as a brand. And abroad, in the larger world, this is the moment to move, to become involved in craft in places like the U.K., Brazil, Vietnam, France, Spain, Portugal, and the rest of the developed world, this is the moment to get going. Because when you set up a 50-50 relationship you effectively build a wall between the two of you, and you build that wall for good reasons, to prevent the big company from interfering with the little one, and ensuring that the little one can operate autonomously. But that wall started to become an obstacle and stopped us from doing things together that we wanted to because we had developed a lot of faith and trust in each other. It was just time to take that wall down so that we could really operate hand in glove. There’s a woman named Charlene Heineken, their oldest son is on the Lagunitas Board of Directors because they wanted him close to us to come to learn about how this new world of beer worked. In many more ways than that, we’re marrying into the family more than it is an acquisition. The world of business has shorthand terms like “acquisition,” “sold-out,” “remaining stock,” that don’t apply in our case because what we’re doing is far more organic than Machiavellian in nature. That’s because we’re dealing with a family, not a bunch of steward-managers appointed by the board of directors and the founders are long gone, where it is just blood and guts. When you say something like that, people are like, “nice spin,” so it’s hard to get past the prejudice and politics. We have to do that over time. Stephen Colbert did a commencement address at some small private college, and in the course of this talk he gets to the “yes, and” which is the heart of improv. That’s something you have to hold in your mind all through your life. If I can keep people’s minds open to Lagunitas, they’re going to find over time that the things that I’ve said, that we’re going to live these principles, and it’s going to be exciting. The truth is, Heineken does hold the paper, so they could shut me down, but I’ve made my bet with humans. One of the things about being an entrepreneur is making bets – when you don’t have enough information to know for certain the outcome, so you’re betting on your own ability to deliver the goods. This is not the first time for me and it won’t be the last. What has the reception been like thus far? I found some incredibly thoughtful optimism, and some bitter vitriol, and some people who said I’ll wait and see, if the beer continues to taste good I’ll continue to support them. How about within the company? I think in the world that we’re in, it’s no longer an either-or world, like “I’m a Bud man, I’m a Miller man.” It’s a “both-and” generation. The cynicism is mixed in there deeply, but they want everything, they want every opportunity. Craft brewing is as fundamentally human a thing as you could ever imagine. Beer goes back 25,000 years, they called ‘em public houses, and it just became pubs, it’s where people went to share news, births, deaths, take on debts and settle debts, start and finish arguments. It sounds like social media, doesn’t it? And beer was the medium. So the public house became the first social media and certainly around Chicago, there were pubs on every second or third corner in the city and they were gathering places for sharing news for a community of densely packed housing. I think social media is an electronic form of the public house, so beer and social media in my mind are intimately wedded. It’s interesting that craft brewing really exploded in the early 2000s just as social media became completely ubiquitous. Insomuch as that’s true, people have friends and followers on Facebook and Twitter, and this is tribe formation. People live and act within tribes. It’s as if we’re the new primitives now. Everything from facial hair, and tattoos, and body piercing, they’re all ways to self-identify as parts of this or that tribe. These are sort of primitive ways of communicating self. Deer would grow into the brush and drag up a bunch of weeds in their antlers as a way to decorate themselves and become that, it’s primal. In this time of social media and the world’s shrinking down to the head of a pin on your screen, I think the business that we as brewers are in, and maybe all consumer product companies for that matter, is the business of tribe formation. Shared stories, shared values, people can be driven out or invited, recruited into a tribe, members of a lot of different tribes. Some people might be members of the Lagunitas tribe, dig our beer and find a lot of personal identification in it, and also be members of the Off Color tribe. You can be a member of all sorts of tribes within the world of beer, or for that matter, Nike or Converse. These things all mean something to people. So the business we’re in is tribe building, we do that through events at the brewery, reaching out in the community and doing the nonprofit donations we do because that’s people at their most primal, when they’re loving something with their time. If we do that alongside them, they’ll show their appreciation by loving us back, and we can recruit them into our tribe. The rest of it, where the money comes from in a business, is noise. Money is a commodity, like water in the beer. People don’t judge the water in the beer, they judge the beer. To me, that’s a richer conversation. April 18: An Albany Park bar toasts the late painter each week at a colorful event. We went to check out the “happy little trees” at Nighthawk. May 12, 2016: If you're in search of great beer in Chicago, a new interactive website can help. The founders of Chicagos.Beer explain. July 21, 2014: The new Lagunitas brewery and tap room in Douglas Park is up and running but founder and Chicago native Tony Magee is always looking to expand.